This afternoon my husband and I went to the Fairfield Winter Farmers Market for the first time. There were a lot more vendors there than I thought. Baked goods and cheeses and vegetables, oh my. 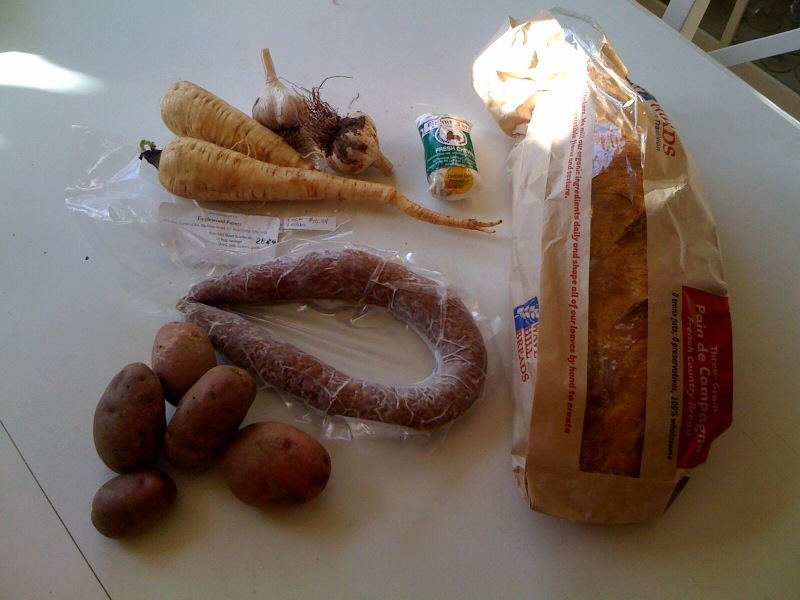 I managed to collect a few things to make some nice local meals this week. The farmers market is open throughout the winter until mid-April. It takes place Saturdays from 10a-2p indoors at the Fairfield Theater Company on Sanford Street. Entry filed under: Farms, Products. Tags: Beltane Farm, Connecticut Locavore, Eagle Wood Farm, Fairfield Farmers Market, Riverbank Farm, Starlight Gardens, Wave Hill. That Fairfield market is amazing. Last winter was my first time going, and I loved it. Have you been to the New Haven one? No I haven’t been to that one yet. I work in New Haven so I try not to go there too frequently on the weekends 🙂 And thanks to the Fairfield market I don’t have to!